Dogs navigate the world with their nose, and because of this, your dog’s nose comes into contact with a variety of things like dust, germs, and dirt. Most dogs develop a cough at some point in their lives, and it can be difficult to determine if your dog is responding to an irritant from the environment or a serious health concern. A cough can be a symptom of a number of different problems in dogs. The type of cough, your dogs breed, age, and environment can all be helpful to your veterinarian in diagnosing the cause of the cough. A cough is a productive reflex that is stimulated by irritation or foreign matter in the trachea or bronchi. It is a protective mechanism to keep the airways and respiratory rate clear of secretion and foreign material. A cough consists of a sudden, forceful expiration of air. Your description of the kind of the cough (moist, dry, hacking, etc. ), when the cough occurs (during rest, activity, night, day, etc.) and if anything brings on coughing is all important information to note, as it can help your veterinarian make a more informed decision about your dog’s care. Wet coughs, also known as productive coughs, help an animal clear mucus and other matter from the lower respiratory passages. Moist coughs produce phlegm, mucous, or foam. Dry coughs, also known as nonproductive coughs, are coughs with no fluid involved and are more involved in an irritation or constricted airway. A deep, dry, hacking cough that sounds similar to a goose honk is commonly seen in dogs with kennel cough and sometimes in dogs with tracheal issues. A sneeze is similar to a cough, but the irritation originates in the nasal passages. A reverse sneeze is commonly mistaken as a cough, and is commonly seen in small and brachycephalic dogs. In a reverse sneeze, the air is pulled forcefully in through the nose rather than pushed out and sounds like snorting. Acute coughing: occurs suddenly and for a short time. Chronic coughing: occurs again and again for an extended period of time. There are many reasons why a dog will cough but there will always be an underlying cause. All dogs cough sometimes, but only a veterinarian can help you rule out some of these causes to pinpoint why your particular dog is coughing and give you a plan for treatment. Here are a few of the more common reasons why dogs cough. Kennel cough, also known as canine infectious tracheobronchitis is a contagious respiratory disease between dogs. Your dog can be infected if they spent time in a kennel, at the groomer, or anywhere there are multiple dogs. A deep, dry, honking cough that sounds similar to a goose honk and worsens with activity is a common symptom. A wet cough can be a symptom of pneumonia, as well as a high fever, difficulty breathing, weight loss, and nasal discharge. Pneumonia can be caused by viruses, bacteria, fungi, or parasites. A cough that is acute and sounds more like gagging, especially when accompanied by lip licking or attempts to swallow, could be a sign your dog has a sore throat, or something stuck in their throat. Grass, seeds, dirt, and other things can be inhaled, and dogs can get small pieces of sticks or toys stuck in their trachea. If coughing doesn’t eject the foreign object after a few coughs, you should take your dog directly to the vet and have it examined and the foreign body removed as soon as possible. Foreign objects can lead to potential infection and pneumonia in some cases. Dogs with heart problems, including an enlarged heart, heart murmur, and congestive heart failure, can all experience bouts of coughing. 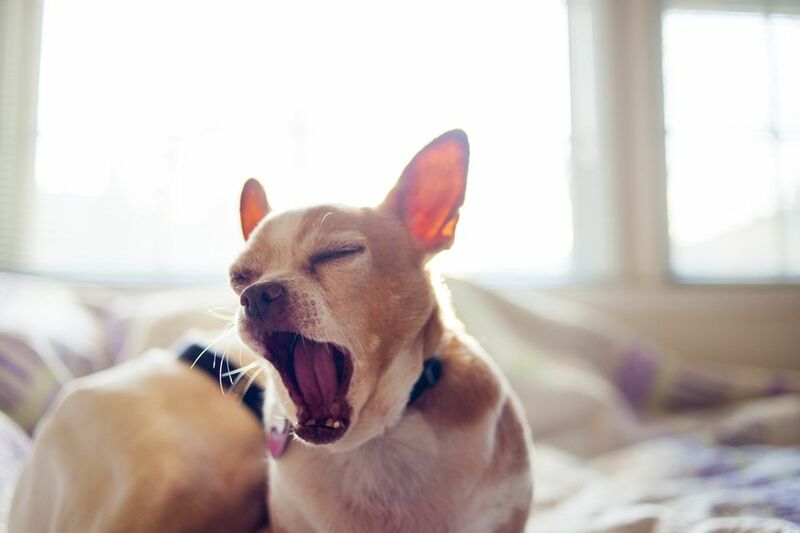 A buildup of fluid in the lungs can cause coughing, especially when the dog is at rest. Coughing can also be an indication of an enlarged heart. When the heart becomes enlarged, pressure is put on the lungs, causing a cough. Tracheal collapse is most common in overweight toy and miniature breeds of dogs, but can occasionally occur in large-breed dogs as well. Dogs with this condition will often have a dry, honking, chronic cough and the cough worsens when the dog is excited, pulling on a leash, or after eating and drinking. Prevention includes keeping your dog a healthy weight, using a harness instead of a collar, teaching your dog to not pull on a leash, and avoiding situations that make your dog cough if possible. Other conditions that can cause coughing in your dog include chronic bronchitis, canine flu, heartworm disease, and some types of cancer. If your dog's cough doesn't resolve quickly on its own or if your dog is coughing violently, get them to the veterinarian. Most coughing related issues are treatable or manageable, especially if caught early. Does Your Dog Have a Collapsing Trachea?